The First Lady, Michelle Obama, has been a champion for healthy, sustainable food since the creation of her historic garden nearly a year ago at the White House. Last month, she launched her "Let's Move" campaign to fight obesity with a flood of media attention and a Presidential Memorandum, signed by her husband, establishing a new Task Force on Childhood Obesity. Recently, the first lady spoke to members of the School Nutrition Association and remarked that the responsibility of feeding 31 million children through school food programs at the nation’s public schools means that food workers are shaping the future of this country. They are teaching the nation’s children critical lessons about nutrition and healthy eating, and can have as much influence on the lives of children as their parents because many children eat 50% of their daily meals at school. Michelle Obama acknowledged that the school lunch programs face budgetary restraints, but credited the Obama administration for making a “historic new investment” toward updating the Childhood Nutrition Act. 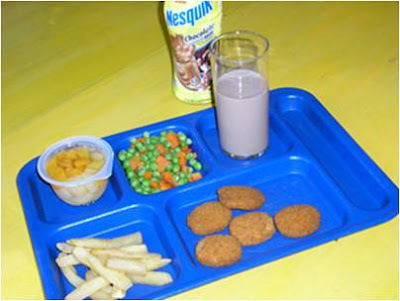 She noted that the National School Lunch Program was started under President Harry S. Truman “after World War II, back when one of the most common disqualifiers for military service was malnourishment.” The most common disqualifier now is obesity. Obama believes that small changes in the school cafeteria can make a big difference in the number of calories that children consume at school. Examples of small steps that could be taken include switching from 2% to 1% milk, switching away fruits served in heavy syrup, and substituting low fat salad dressing. She said that over the course of a year those changes can mean the difference in a child being at a healthy weight or obese. To read the original abcnews.com article covering this event, click here.